"outdoor enthusiast and self-confessed outdoor gear freak"
Dave has owned Hilltrek for 15 years when he bought the company from Evelyn and Andy Tivendale, who founded the company in 1980. Although Dave has spent most of his working life as an electronic engineer and finally senior manager in international electronics companies, he is an outdoor enthusiast and self-confessed outdoor gear freak who prefers the outdoors to offices. On his days off, Dave can be met on top of a mountain selling the benefits of Hilltrek gear, on his bike on one of the hill tracks around the Cairngorms or with his camera trying to capture a ‘once in a lifetime’ photograph of a mountain hare or West Coast sunset. When he can get enough time off he can be found on a trek in the Himalayas, testing himself as well as Hilltrek clothing. As well as managing the company, Dave is the main garment field tester and contributes to the design specifications of new garments. He worked to develop the Cotton Analogy® concept based on his experience of Ventile® and Nikwax Analogy®. 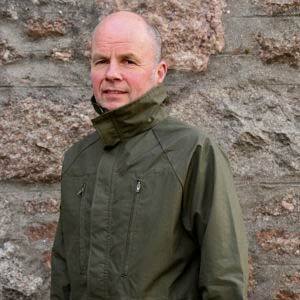 Dave has tried most of the outdoor garment concepts in his 40 years in outdoors - hiking, camping, fishing and cycling – but believes that there is little to beat Ventile® and Nikwax Analogy® for protection against the elements and breathability. He is also a lover of live music with eclectic tastes ranging from classic rock to Celtic music. He would have loved to have been a professional climber or play the sax in a rock band. "Experienced dressmaker with hands-on tailoring expertise"
Heather has worked in the clothing business most of her working life, firstly as a dressmaker then in a tailoring firm making tailored garments or working wonders with clothing alterations. 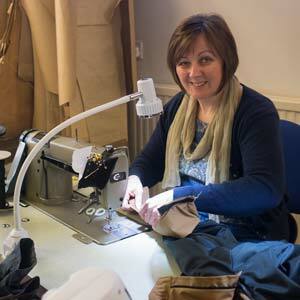 Joining Hilltrek in 2006, Heather looks after your outdoor garment from cutting table, to sewing machine and finishing. She literally knows every piece of Hilltrek clothing inside and out! If an item comes in for repair, Heather will know exactly how to fix it. Heather loves working in a small team environment and, with her hands-on tailoring experience, enjoys contributing to design ideas. Away from the workshop, Heather takes much pleasure in yoga, tai chi, swimming and walking her wee dog. Always enjoying the scenery that Deeside has to offer, she also enjoys art and a good sci-fi or fantasy novel. 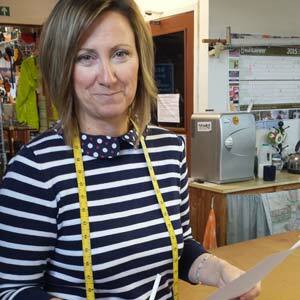 "Susan is the enthusiast at Hilltrek - always buzzing with ideas." Susan is the creative force behind Hilltrek, her ideas driving new clothing designs and various aspects of our business. She is an excellent listener and readily absorbs customer’s feedback into our products. Susan’s designs are found amongst all of our new products. Way back, Susan was the company’s first apprentice and returned 11 years ago after having her family. She is now responsible for design and manufacture. Susan loves photography especially anything which involves the beauty of the outdoors. She enjoys travelling, especially in Scotland which is just as well because supporting her champion golf playing daughter takes her around many of the top Scottish Golf courses. Top of her bucket list is to explore the Hebridean Islands on her bike. Susan likes the simple things in life - her early morning dog walk or cycle before everyone is awake is the best time of the day. A good game of squash, in fact all racket sports, keeps her fit. 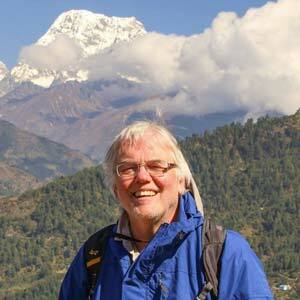 "Dave is a great lover of the outdoors - hill running, walking and biking." Dave has been part of the Hilltrek team since 2013 and is responsible for looking after the day to day business in the shop. That means if you ring or e-mail then it will usually be Dave that you will be in contact with. Although born in Aberdeenshire, Dave spent most of his time in Lancashire before returning to his “spiritual home” four years ago having retired from the Police. Having two Dave’s at Hilltrek does cause confusion but based on accents we now have “Aberdeenshire Dave” and “Lancashire Dave” which does help you when on the phone. Dave has a great love of the outdoors whether it be hill running, walking or biking so working in an outdoor business is more like pleasure than work. Dave competes in hill running races and triathlons and incorporates biking to work as part of his training although he does say what better an incentive to bike and run than doing it in the fantastic Deeside countryside. In his spare time Dave is happy on the hills or on his bike but having recently inherited a garden is learning how to make it grow !